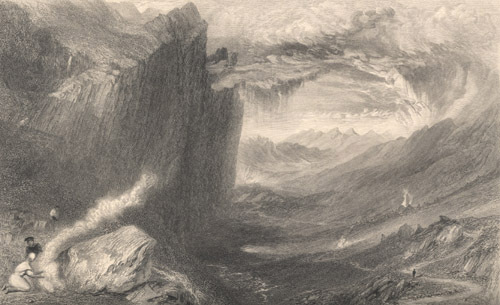 Glencoe, engraved by W. Miller after J.M.W. Turner (1836). From: The Prose Works of Sir Walter Scott, Bart. Vol. 25 (Edinburgh: Cadell, 1836). The Massacre of Glencoe took place on February 13, 1692. As an example to the predominantly Jacobite Highland clans, a government order was passed that all of the MacDonalds of Glencoe under seventy years of age were to be slaughtered in punishment for their (unavoidably) late compliance with an order to swear allegiance to William of Orange. The clan were attacked by government soldiers, mainly belonging to the rival clan Campbell, who had been quartered upon them. Thirty-eight Macdonalds died, many surprised in their beds.